If “park ranger” makes you think of that cranky cartoon character who chased Yogi Bear and Boo-Boo around Jellystone Park, and you think you’d have to visit a state or national park to see a real one—welcome to my world. 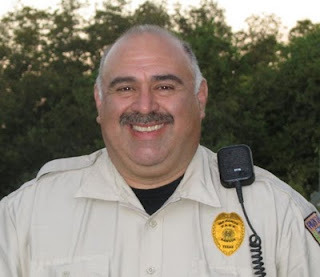 That’s pretty much how uninformed I was until I got wised up a few weeks ago, thanks to a delightful conversation with Larry Soza, the newest park ranger right here in our own little ol’ city of San Marcos. This past June, Larry joined the local force of about fifteen park rangers (fifteen—who knew?) as the one and only full-time member. Launched into his new job amidst the turbulent rush of summer river traffic, he quickly came to rely upon the knowledge and experience of his part-time colleagues, many of whom are San Marcos natives or long-time residents, and several of whom split their time among other such public-service careers as firefighters, paramedics, and sheriff’s deputies. An old axiom about park rangers is that they protect the people from the park and the park from the people. Larry seems to have the skills and the perspective to handle either side of that equation, as well as its corollary of protecting the people from the people. When tourists and river visitors swarm San Marcos in the summer, who or what gets protected may be a tossup, although first aid, safety, and rescue missions no doubt take priority over resource preservation. But now that the seasons have changed and crowds subsided, Larry is eager to spend more time exploring San Marcos’s parks and greenspaces, seeing to the improvements and preparations that will facilitate protecting them just as well as the people who visit them. If you chance to meet Park Ranger Larry Soza, you’ll probably be happy to find he’s a most congenial fellow—and wears an unforgettable smile that rightfully belongs in a Crest commercial. Just remember, don’t be hoisting any pick-a-nick baskets (or practicing archery in a greenspace, or carrying glass containers at the river, or littering at your next family barbecue). You don’t want him smiling at you all the way to jail—right, Boo-Boo?